Pit bull advocates try very hard to like to say that breed is not the issue in safety concerns about fatal and maiming dog attacks even though pit bulls kill more than all other kinds of dogs combined. Advocates point to several other issues they blame for dog attacks: unsupervised dogs; unloved dogs; untrained dogs, unsocialized dogs - but, given that dogs of all breeds and types are mistreated, none of that changes the fact that pit bulls, at 6% of the total dog population, kill more people every year than the other 94% of dogs combined. And the big lie is that when other breeds of dogs end up killing you will almost always find that the dog was not a family pet, not trained or socialized. Most often, pit bulls that kill were not well take care of either. But unlike other kinds of dogs, pit bulls that are well loved, trained, and cared for family pets that never showed aggression before in their lives also kill. This is virtually never the case for other types of dogs. 2016 FL - This woman's "throwback thursday" is a memory of her pit bull of 7 years that was a really "super dog." One day he almost killed her and would have killed her without intervention. 2015 SC - A pit bull mauled its owner's sister's arm so badly that it had to be amputated. All the victim did was call Bull's name. Witnesses said that the arm was completely snapped and hanging only by the "meat." The pit bull tore off the woman's knee cap as well. The owner was upset that the pit bull was shot as she and the pit bull were inseparable. Her daughter emphasized that he was a good dog. This attack also appears on the list of dismemberment attacks. 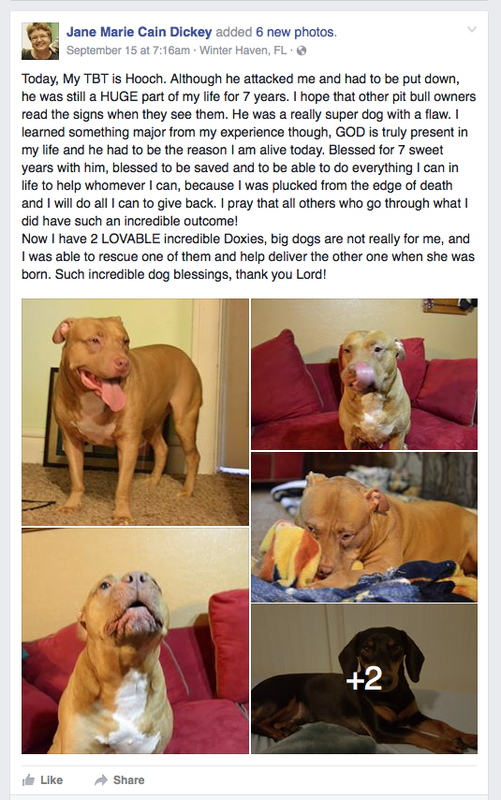 2015 KS - Shelly LeRoy was attacked by her pit bull after she said “no” to it. She had loved and raised the dog since it was a puppy and it was 8 years old when it attacked. Shelly called her dog “my boy” and it often slept with her. It had never shown aggression before. 2015 TX - Brayden Wilson 2 mos - An 8 year old pit bull that had been with the family since it was a puppy and had been raised with two older children as a part of the family and had never shown aggression, killed a 2 month old baby with no provocation. Brayden’s mother said the pit bull played with children every day. 2014 IL - Kara Hartrich 4 yrs - (133 miles SW of Oak Park), 4 year old Kara Hartrich was killed on her 4th birthday by the family pit bulls that she picked out herself as tiny puppies and played with and snuggled. When her grandmother picked her up to save her, they pulled Kara out of her arms to kill her. For no reason. They acted normal immediately before and after they killed Kara. 2013 GA - Beau Rutledge 2 yrs - Beau Rutledge was brutally attacked and killed, silently in minutes, by the pet pit bull, Kissy Face. The family had owned Kissy Face for 8 years and raised Beau’s older sister with Kissy Face. Kissy Face had loved Beau, and then in an instant killed him. His mother said that Kissy Face looked confused after the attack and Animal Control observed her and tested her temperament for 10 days after the attack and she showed no aggression whatsoever. 2011 CA - Darla Napora, a supporter of BAD RAP pit bull advocacy group, was killed by her beloved pit bull Gunner. That night, Gunner has slept in Darla's bed as he always did. Neighbors reported that the Gunner was trained, extremely well cared for and loved. Darla was 8 months pregnant when she was killed and her unborn child died, too. The ashes of the killer dog were buried with Darla. Her husband Greg said pit bulls "are the most loving animals I have ever had in my life" after his pit bull killed his wife.